Busy weeknight? 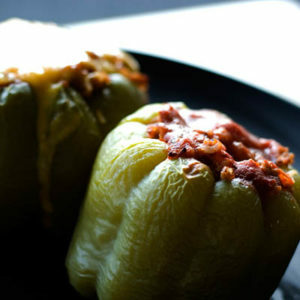 Try my quick and easy chicken cacciatore stuffed peppers. I had leftover rice from my take-out Chinese, so at the supermarket I bought jarred red pasta sauce, several whole green peppers and a rotisserie chicken. Cut the tops off the fresh peppers and remove the seeds. Mix together the cooked rice, pasta sauce and diced chicken, then stuff the peppers with the mixture. I baked mine in a 350° oven for about 30 minutes, and it worked. Out came a bubbling pan of hearty chicken cacciatore stuffed peppers for a busy weeknight. Wait. Are you telling me that all these years I’ve been par-boiling the peppers before stuffing for nothing? That certainly cuts down on prep time, but leaves me wondering about the finished product coming out thoroughly cooked. Guess I’ll have to try it. Might even mix in some mozzarella cheese to see if I can put an even more Italicized slant on the dish. Many thanks.